BIC CAMERA is one of the largest electronics retailers in Japan. It offers a lot more than just the latest cameras and other digital gadgets. It has a wide range of product such as cameras and home appliances, but also complete with everything that one would need including pharmaceuticals, cosmetics, toiletries snacks, liquor, toys and sports equipment. 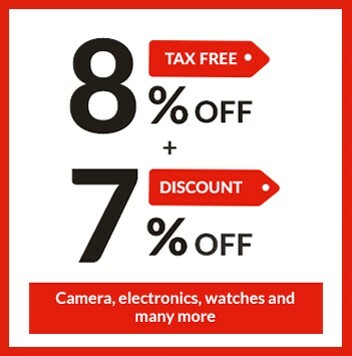 *Discount is not applicable for Apple products, Rolex, Nintendo Switch (gaming console, accessories, and software), liquor, outlets products, second-hand goods. Discount cannot be used in conjunction with any ongoing promotions and vouchers. Discount in Air BIC CAMERA store is different. The discount and tax exemption are not applicable to Japan passport holder. Payment for liquor has to be made at liquor cashier’s desk only. Please check with the staff should you require more information. Please present your passport to enjoy the discount and tax exemption. Present the coupon at the cashier's desk upon making payment. Changi Travel Services Pte Ltd shall not be responsible for the quality, merchantability or the fitness for any purpose or any other aspect of the products and/or services provided by third parties and Changi Travel Services Pte Ltd shall not at any time be responsible or held liable for any loss, injury, damage or harm suffered by or in connection with the products and/or services provided by third parties. All disputes about the quality or performance of the product and/or services shall be resolved directly with BIC CAMERA.